(L) Mens 70s HBarC Western! White w/ Big Red Polka Dots & White Topstitching! Home > Vintage Western Shirts > LARGE Western Shirts > (L) Mens 70s HBarC Western! White w/ Big Red Polka Dots & White Topstitching! Mens vintage 1970s H bar C Poly Western Shirt! 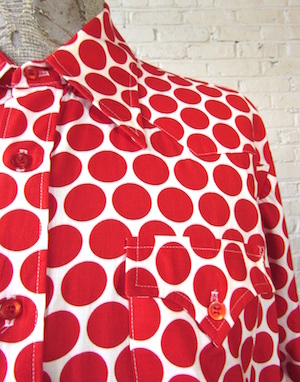 This terrific shirt has a white base covered in big red polka dots and finished with white topstitching! Has an extra wide and pointy 70s era collar. The two chest pockets have button and flap closures that are super pointy as well. 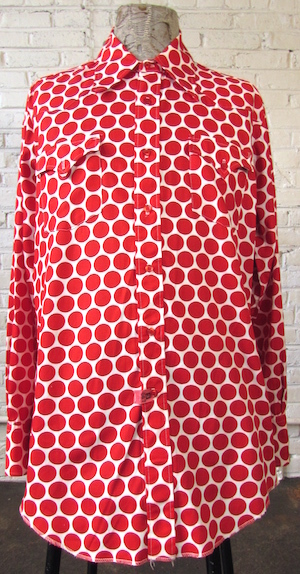 Closes in the front with pearly red buttons with two matching buttons on each cuff. Shirt has a tapered hem. Made in the U.S.A. Tagged HBarC Long Tail. No material tag, but feels like 100% polyester. Condition: Very Good: Has a very light yellowish stain on the left or the collar and also on the left pocket flap. There are also a few light yellowish stains that go around the whole of the left cuff. Does not detract from the awesomeness of this shirt! Still 100% cowboy-fabulous.